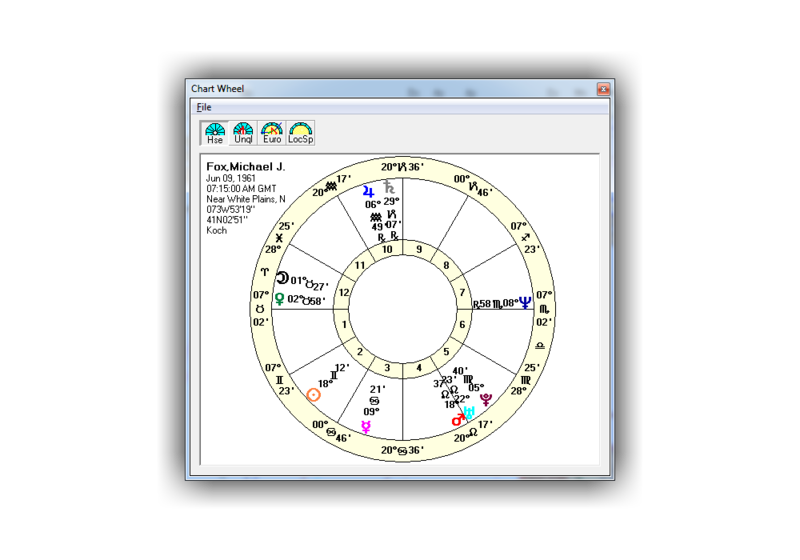 Designed for advanced and specialist astrologers (as well as beginners), Win*Star 6.0 handles offers charting routines for Cosmobiology, Uranian astrology, Horary and Relocation. Click on the thumbnail to pop-up a full size screen-shot sample of the particular wheel. 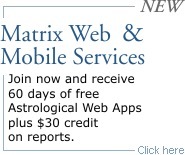 Cosmobiology is a new approach to astrology developed by Reinhold Ebertin. Using only Ascendant and Midheaven angles, this system eliminates houses as a factor in chart analysis. 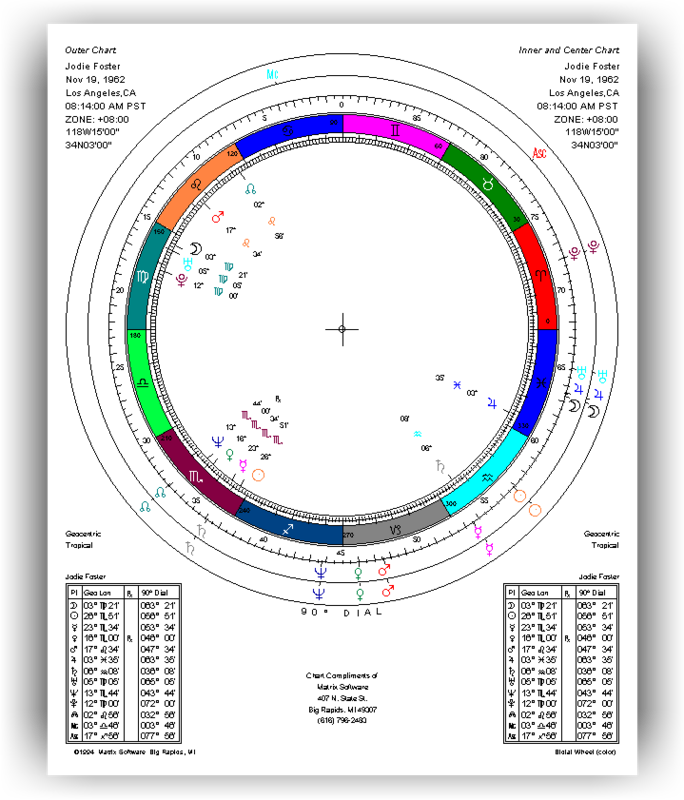 Cosmobiology uses the 90° dial and graphic ephemeris as basic tools, and focuses on delineation of midpoint structure patterns. 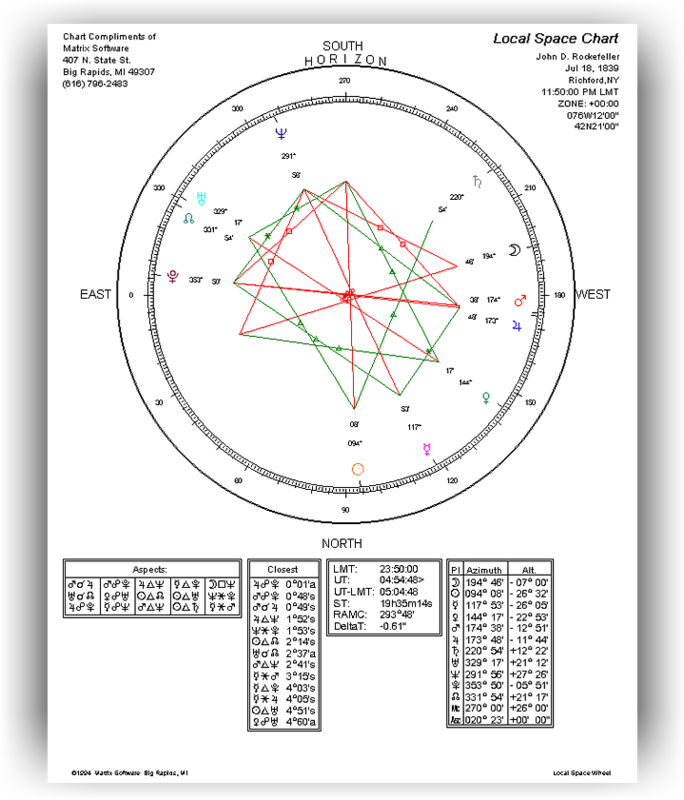 Graphs include progressed life diagrams and transit graphs with natal positions included. 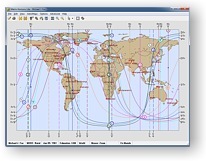 Charts are progressed using solar arc directions. This is a 360-degree wheel with two 90-degree dials for cutting out and moving around the wheel. They are designed to tack down to a board and are useful in Cosmobiology. This color wheel allows comparison between two sets of data. This 90-degree dial was designed by Matrix for renowned Uranian astrologer, Arlene Kramer. 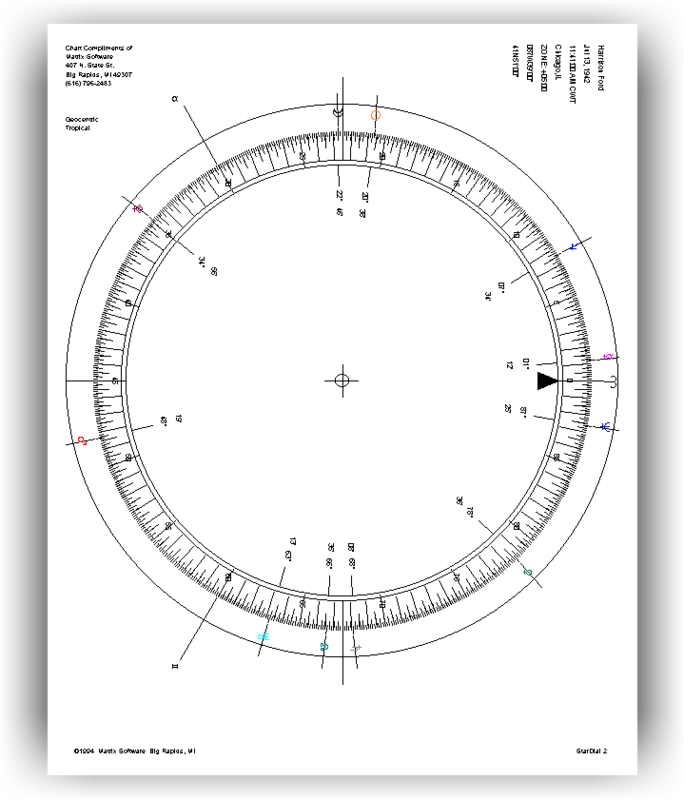 The Uranian zodiac wheel has the rising sign centered at left, aspect lines in the center, and houses and zodiac indicated in concentric outer rings. Horary Astrology is for answering questions based on the time the question is asked. 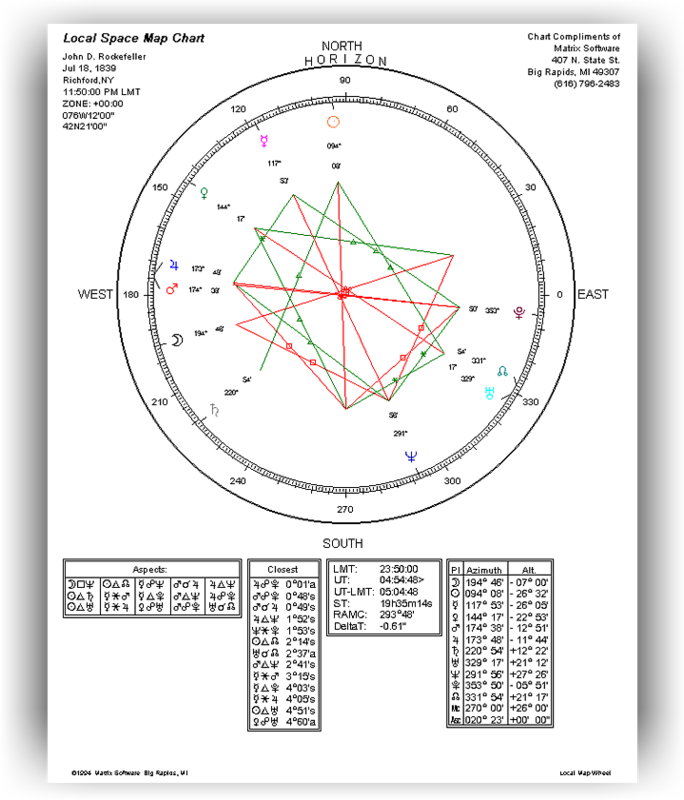 There are many techniques specific to Horary Astrology, and Win*Star 6.0 has a wide range of them. 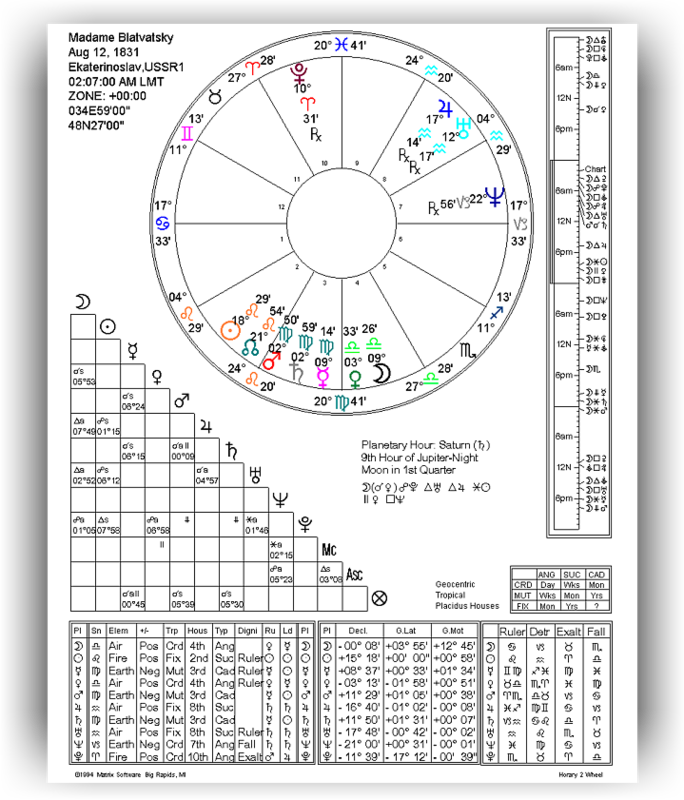 Win*Star 6.0 includes Lilly point totals, Essential Dignities, and chart forms that show the movement of the Moon and horary strictures. 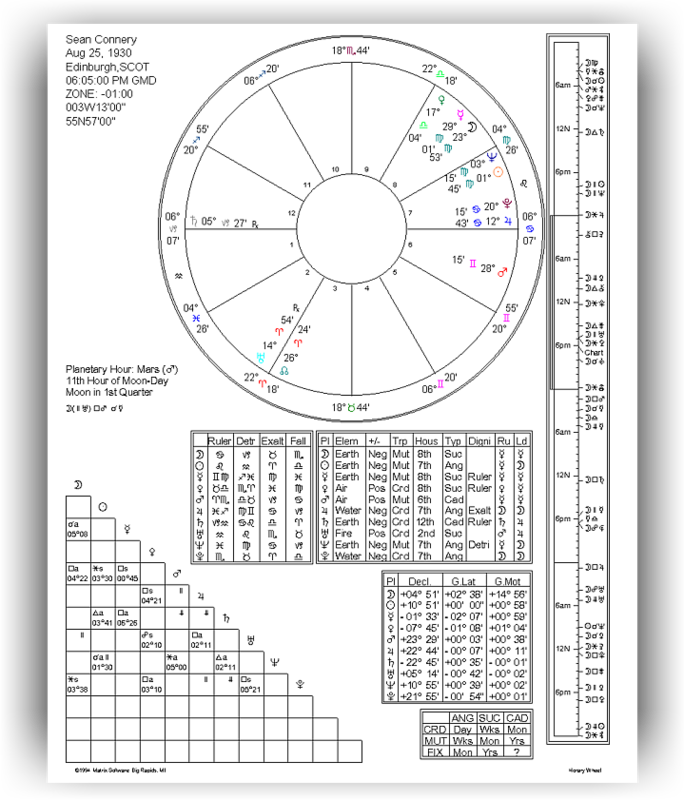 This horary form has a four-day aspect scale, elements, dignities, declination, latitude, motion, planetary day and hour, lunar aspects table, and tables for rulership and timing. Another specialized Horary wheel with a variety of predictive features. This specialized horary form has approaching and separating lunar and planetary aspects, planetary day and hour, strictures, mutual receptions, daily motion and speed, occidental and oriental, antiscia, latitude, exaltations, Lilly's point system, joy besiegement, critical degrees, and special four-day aspect scale. 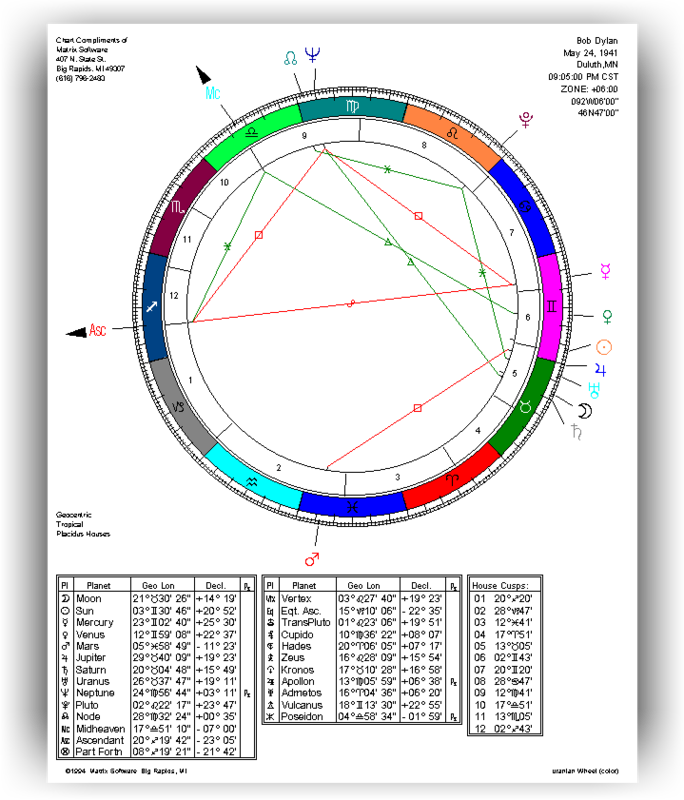 Local Space Astrology is the study of prediction based a given location, viewing the chart as a map of the 360 degrees of the horizon surrounding an event, such as one's birth. The various planets' positions are then plotted on it. Local Space can be used to determine favorable directions to turn for certain endeavors. This is a local space map with an open wheel and planets in horizon coordinates. It has 0 degrees = East on the right (3 o'clock position) and 90 degrees = N at top, aspect lines, as well as planet and aspect tables. 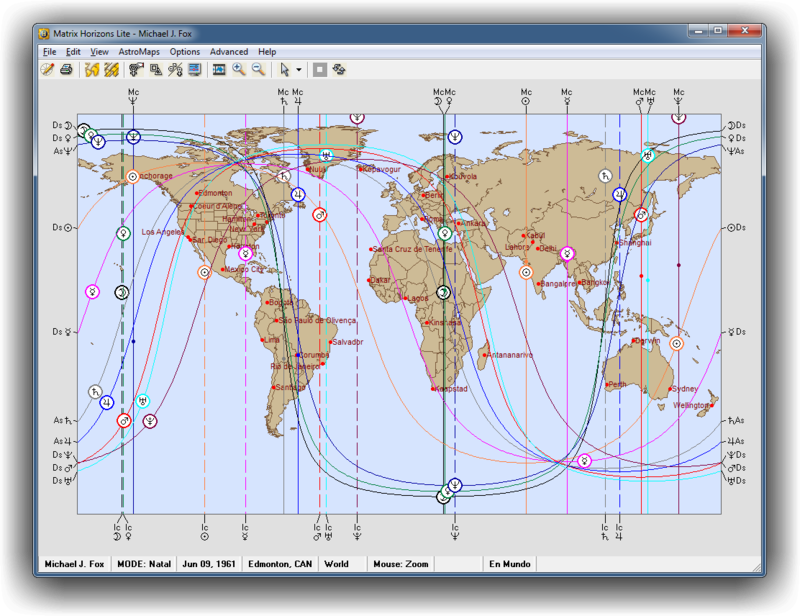 A Local Space wheel with planet positions shown in azimuth & altitude as pioneered by Michael Erlewine. 0 degrees = E at left, and 90 degrees = N at bottom. 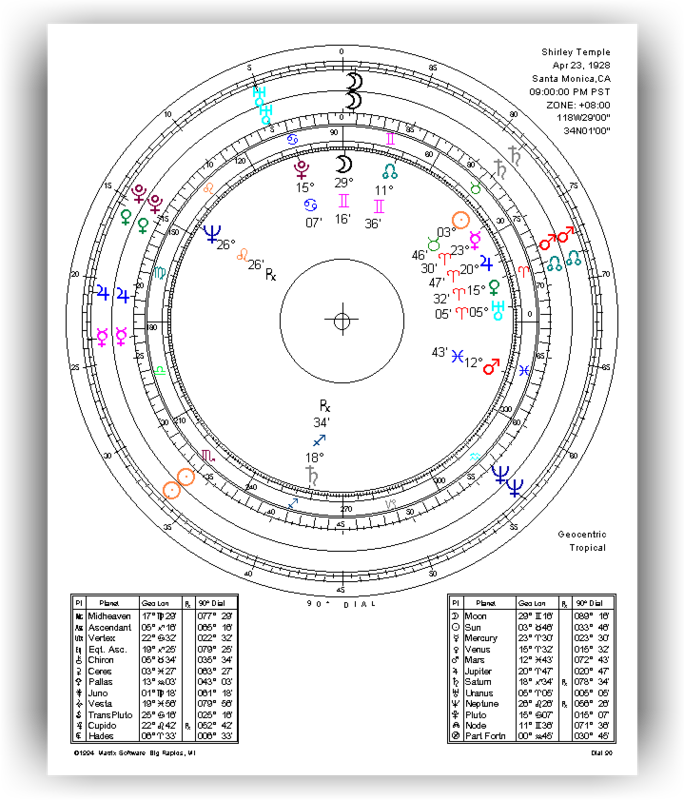 Relocation is based upon the idea that when one changes direction, even though the planets in the chart stay the same (in degree and minute), the house cusps change. In a new location there is then a new ascendant and midheaven which give that location a different potential.